OCCUPATION/RANK: A candidate at the Healing Den, and former waitress/entertainer @ Rattlesnake Cafe. HAIR: Human: very light gray-brown. Lynx/bobcat: Very light silverish-grey, soft, thick fur, with a white underbelly, and pointed ears with black ear tufts. Some dark bands across back, legs, tail, face and rest of body. EYES: Yellow-gold and big, curious, and semi-wise. PHYSICAL DESCRIPTION: A small mixed-wildcat (a mix of bobcat and Euro/Canadian Lynx), with big paws, small, lithe body. A round, cheerful face, and a short little 'bob' tail. Whiskers surround her little nose. Pointy ears. Large, curious, semi-wise eyes. VOICE QUALITY: With all the ranges of the domestic cat as well as the wild-cat. A slightly rasping voice, sometimes. 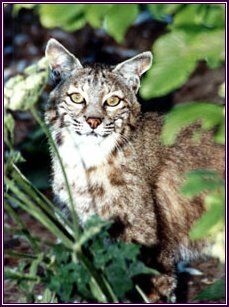 LITERACY: Literate only in the language of bobcat and lynx. HABITAT: Adaptable. Semi-desert, sub-tropical swamps, coniferous forests, mountainous, rocky areas, snowy or frosty areas, open farmlands near forests, and scrublands. She prefers forests with a lot of cover, though. FAMILY: She's solitary and although she must've once had some strange sort of family, they don't live with her now. SO/R: Chaun is usually straight, and always straight as a wildcat, but in her human form she's not opposed to either gender. She is fairly young and hasn't mated with any other wildcats, yet. 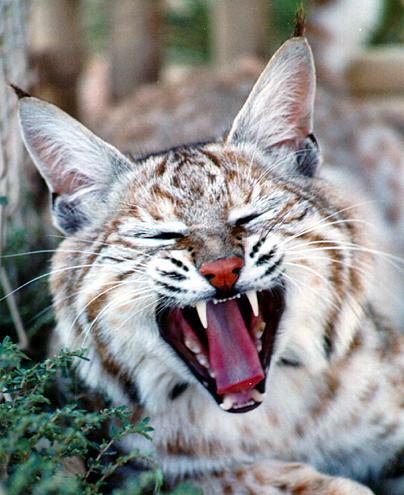 When she's ready, she will emit several noisy calls until a male wildcat hears and responds--and comes to her 'aid.' After about 50-70 days, 5-6 kits will be born. SKILLS: Chaun can climb small trees, and is a powerful swimmer. Her warm coat and big paws help her to stay on top of the snow. As an opportunist, she will eat hares, birds, rodents, peccaries, prairie dogs, bats, anthropoids, porcupines, and snakes, even rattlesnakes! As a female, Chaun is restricted to small game, although she sometimes manages to catch a small deer. She has also been known to eat domestic animals and fruit. She can live anywhere and is a tough little wildcat. PASTIMES: Chaun enjoys climbing trees, swimming, playing (in water, on land, in snow), and hunting. PERSONALITY: Chaun is a playful and curious wildcat, with a sweet nature. An intrepid wanderer, she never hesitates to push the boundaries, try new things, and stick her nose into things. Chaun woke up, yawning, her pink tongue curled out of her mouth, touching her little nose. She opened her golden eyes and focused on her dirty fur. The pink tongue rolled out, lazily licking her paws and running them across her head. She rolled over and bathed her stomach, then s.t.r.e.t.c.h.e.d. and stood up, heading for the light at the end of her shelter, the abandoned den of a fox that she had widened. It was a long tunnel to her sleeping area, which ajoined to her cache--a small assortment of mice--and her toilet. Chaun emerged from her den and stretched again, purring in the sunlight that dappled her coat and the pine needles that covered the moss-covered earth. Pouncing on a mouse, she had her breakfast. Chaun went back into her den, and emerged with a pair of faded jeans, a gray-brown turtleneck sweater, and tan high heels. Quickly she shifted from lynx-cat to human, a slight fuzz of silver fur upon her tan skin. She slipped into the clothes and ran her long fingernails through her tangly silver-brown curls while stuffing her toes into the achingly, stylishly uncomfortable shoes. Darting a quick glance at a pool of water, she smudge bronze onto her lips, winked, and flashed a dazzling sharp-toothed grin at her reflection (it swooned ^^) before scurrying off down a dirt road, wincing as her toes were pinched. Chaun wobbled into the little town next to her forest; Whipple was its name, and civilization had never quite reached it. There were a few homes and stores and little diners, but everybody knew everybody (unless they were from out of town), and the roads were still dirt. Chaun entered the back door of the Rattlesnake Cafe and hurriedly pulled on her waitress outfit: white tights, red high heels, short red and white striped dress (her tail poked through the back) and ruffley white apron with pockets. Chaun opened the double swinging doors and stepped into the cafe, behind the counter. Her boss, Mr. Jamison, noticed, and walked over to her. Chaun cringed as he narrowed his eyes and pulled on his peppery mustache. "Chaun!" he growled. Chaun stared at him with her big golden eyes and smiled innocently. "Yes sir?" she said in a quieet voice. "This is the second time this wweek you've been late to work. For crissakes, girl, why do you even bother getting here?" Jamison demanded. "I'm sorry, sir," Chaun replied meekly, "but I live so deep in the forest and it's so hard to walk in these shoes..." Jamison snorted. "That's no excuse. Haven't you any brains?" "You're an animal! Just run to work! I don't care if you show up as...as...a show-dancing bear, so long as you're on time!" Jamison sputtered. Chaun giggled quietly and Jamison glared. "Never mind, girl, just get to work." Chaun nodded and sauntered over to a table where a young mother and her little boy sat. "Hello ma'am, may I take your order?" While the woman ordered, Chaun winked at the child and slipped him a chocolate heart. It was only after Chaun left that the mother realized she got one, too. So it went over the next two weeks. Chaun kept showing up late, embarassed to show her feline side to Whipple, and Jamison kept letting her off the hook. He really was a kindly man, underneath all the fuss and bother and tough-guy image. Chaun kept doling out little gifts to people. She also added other sunshine to the bleak Rattlesnake Cafe, singing and strumming on a banjo. Sometimes she did dance numbers. The public enjoyed it, liked the little treats they received and the special attention at their birthdays or the 'cheer-up' cards with sunny faces, the singing and the dancing and the way she winked at you and grinned with two plates in her hands, another on her head, and sometimes more balanced on her hips. And Mr. Jamison was certainly not averse to some extra customers, especially from out of town. However, all good things come to an end, and for Chaun, the end was her tardiness. One morning, in a hurry to get to work, Chaun remembered that Jamison had said she should run to work, and left her clothing behind to swiftly zigzag through the forest in a shortcut her heels couldn't do. She kept her lynx-cat shape that day, and entered Whipple as such. When she got into the Cafe, she was so flustered she quickly tugged on her clothing and didn't quite change all the way, and walked through the doors with a little extra fur, her whiskers and muzzle, ears, and sharp, sharp teeth. Someone screamed, and a child began to cry. There was a general outcry. Chaun looked around and heard the angry and frightened voices of those she had entertained for several weeks, been involved in their lives and gave them sunshine. Her big eyes got even bigger. Mr. Jamison turned bright red and ushered Chaun backwards through the doors. Chaun left early that day, although Jamison had not fired her. When she returned the next day, looking spiffy in her outfit, immaculate in red lipstick and a special updo with her hair, and no fur at all, no claws, and no tail, in a special effort to look completely normal, she stepped through the doors as usual. No one looked her way. Even Jamison turned his eyes away and stared intently at his money. "Mommy, look, it's the kitty-girl!" some child said loudly, and was hushed by her mother. Chaun picked up her banjo and strummed quietly, humming. She moved around the Cafe, trying to get people to look her in the eye. No one would. She left little treats as usual, and they were all still on the tables when the customers left. By midday, the place was empty as a graveyard at midnight. Mr. Jamison let her go, for certain. Chaun changed slowly back into her faded jeans and sweater and her shoved her blistering feet into the heels, and walked home. Chaun huddled miserably in her den, watching the rain come down outside and the lightning flash, thunder rolling ominously. Since the day she had been dismissed from her job, Chaun had shifted to her lynx-cat form permanently, and lived as such. She had known it had been a gamble, going to work among the humans, who were so fickle and wary of things that were different. Chaun was different. Humans did not like the shifters, especially. Perhaps they were jealous. Maybe just frightened. At any rate, they had finally cast her out. Finally, the rain stopped, and Chaun left the sanctuary of her den, to climb a tree. She had heard a family of baby birds up in a nest somewhere, and her lynx-cat nature was hungering after them. However, when she reached the top of the tree, she found she couldn't do it. She was too used to her mostly human form, and besides, they were so little and naked and defenseless, those baby birds. She slid back down the tree morosely. "Cat-girl!" Chaun perched precariously on the tip of the slanted tree she had climbed. Tired of her finger-less lynx-cat form, she had once again shifted, although she wore none of her old clothes and was instead covered in her thick pelt, complete with claws, teeth, and whiskers--even the strange wildcat ears poked out of her silvery curls. "Chaun!" Chaun looked down, her golden eyes widening. Mr. Jamison stood down there, looking dapper in shiny black shoes, a gray striped suit and a felt hat, twirling his moustache and grinning at Chaun. "C'mon down, girlie," he shouted. Chaun bit her lip, but slid quickly down the tree trunk. Jamison caught her at the bottom and blushed, her soft fur between his fingers. He set her down, very gently. "Chaun, girl, we miss you," he said, quietly, looking at the ground, "especially me. I kind of wish you would come back." Chaun stared at Jamison and he looked quickly at her. "That is, if you want to," he grumbled, and took her hands. "The truth is, all I can think of is you. You are a bright light in my life, the sunshine-y cheerfulness that gets me through my day. And...I'm willing to move the Rattlesnake Cafe for that. To Canada, if need be." Chaun smiled. "That's where I belong, after all," she murmured, her fur melting away, leaving only a little bit, making her look much more human. "But will humans accept me, even there?" "They won't have a choice," Jamison said fiercely, and coughed. He smiled at Chaun, hopefully. She sighed, and looked around. "I'll get dressed," she purred softly, her voice tinged with sadness and excitement, and led him to her den, where he waited outside as she changed into her customary, rough garb. Only this time, there would be no pinching heels. Chaun went barefoot, or not at all. Suddenly, Jamison's yell of anger and surprise sent her hair on end and she crawled out of the tight space as quickly as possible. "Oh, don't get your moustache in a twist," said a tall woman on the back of an enormous green-gold dragon. She looked over at Chaun and smiled pleasantly, while all the wildcat could do was stare, her enormous eyes even bigger, if possible. Jamison looked back and forth between them, frowning. "You-aren't--" he began, and Chaun laughed, moving to stand beside Jamison. "Oh, no, I don't even know her!" she exclaimed. But the sight of the dragon-riding woman made her want to know, where she came from and what the strange duo was doing there, in her home. Jamison relaxed and the same look of exhilaration and interest glowed in his coal-black eyes. "So who are you?" he addressed the woman, taking his hat off. "Baeris of the Healing Den," she replied coolly. "You might as well come, too." "Where?" Chaun and Jamison said in unison, Chaun breathless and Jamison indignant. "The Healing Den, where else?" Baeris said, chuckling. Chaun jumped into Jamison's arms and kicked her heels, and for a moment he turned bright red and grinned broadly, not knowing what to do with her! The other of the shaking eggs from Merrameth's last egg also contained a blue who rose to his hind legs and bellowed, a sound which petered out into a little squeeky chirrup. "Oh, what kind of noise was that?" the lynx girl Chaun laughed, and didn't hesitate to move toward the blue. He made another giggling chirp, and Chaun looked up at Jamison, who applauded from the stands for her. "You've got to be more ferocious, Linisteth!" Though the dragon tried repeatedly, he couldn't manage more than a little squeak - but that seemed enough for Chaun. A large blue with a good upright ability, around 28 feet long. He will never be able to bugle but he has a lovely voice otherwise.